The Minnesota Riviera . . . | A balanced diet . . . The Minnesota Riviera . . .
Minnesota Riviera? Yes, you could call it that. With its beaches, bays and secluded coves, its headlands and cliffs, along Lake Superior’s North Shore, not to mention its summer temperatures in the 80s and 90s at times (let’s forget about those sub-zero winter extremes), it’s as attractive and warm as the south of France. Minnesota has about 150 miles of coast along Lake Superior, a body of water vast enough to appear like the ocean itself. Indeed the lake statistics are impressive. It is the largest freshwater lake in the world – by surface area, at 31,700 sq. miles, and the third largest in terms of volume. The maximum depth is 1,332 feet, and its surface is about 600 feet above sea level. At over 160 miles across, it experiences some severe storms in winter, with waves regularly reaching 20 feet, and 30 foot waves not uncommon. But more of that later. And we took advantage of our visit to travel north and visit Duluth, the most westerly port on the Great Lakes, as well as the Boundary Waters Canoe Area Wilderness (BWCAW) along the Gunflint Trail just south of the international border with Canada (Ontario). This is the route of our trip. Duluth is the fourth city of Minnesota in terms of population. At one time there were passenger services connecting Minnesota with the Atlantic Ocean. Now the port is a major conduit for coal and iron ore. Part of the old port area – Canal Park – has been transformed into a tourist attraction, with the conversion of some of the old warehouses into hotels and shopping venues. There’s also a large aquarium featuring the biology of Lake Superior. One of the Great Lakes steamers, the William A. Irvin, is permanently moored (just behind our hotel in fact) and converted to a museum. Here are some more photos of the Canal Park area. One of the the main landmarks is the entrance canal to the harbor under the Aerial Bridge. The main span is at road level, and is lifted to varying heights depending on the size of the ship wishing to pass through. During our walk-about, we saw the bridge lifted twice: the first time for a pleasure cruiser offering a tour of the harbor and Duluth Bay, and secondly for an ore freighter, the Hon. James L. Oberstar (of the Interlake Steamship Co.) – very impressive. Here’s the freighter approaching the bridge and signalling its intention to pass through, and given the all-clear from the bridge operator. And this photo just shows how high the bridge can be raised to let the biggest ships through. T he evening of our stay we decided to eat in the steakhouse attached to our hotel. It was offering a free appetizer per table and free drinks (it was happy hour). For the appetizer we chose local Minnesota (and Wisconsin) speciality – you’d hardly call it a delicacy: cheese curds. Actually these are pieces of cheese (usually Cheddar or Monterrey Jack), coated in batter, and deep fried! One plate for the two of us was plenty. I wonder how much that contributed to my cholesterol levels? We hit the road early the next day, heading north. Highway I-35 ends just north of Duluth, and is replaced by scenic highway US 61. Between Duluth and Two Harbors there is an expressway, but the old road (still an excellent surface) meanders alongside the lake, with some stunning views. 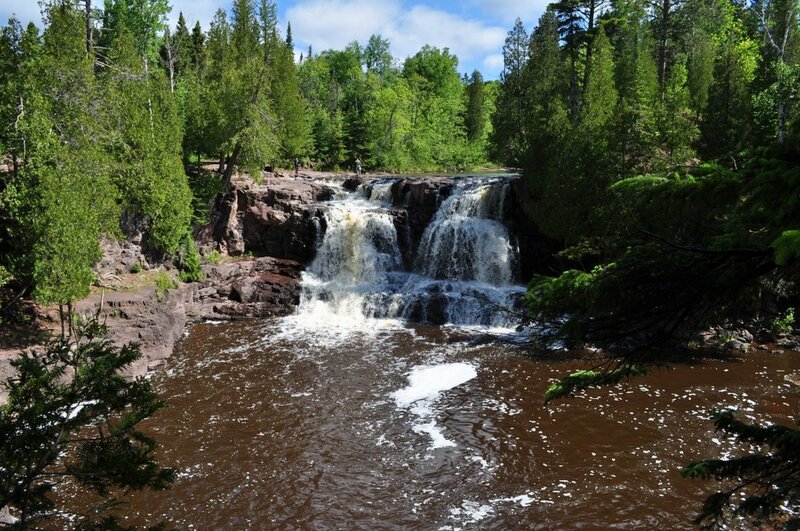 We didn’t stop in Two Harbors but headed for our first destination: Gooseberry Falls State Park. Just beside the road, the falls drop in five cataracts to a meandering river that empties into Lake Superior at Agate Beach. We took the 20 minute walk down the falls to Agate Beach, but didn’t find any agate. In any case removal of any stones is prohibited. 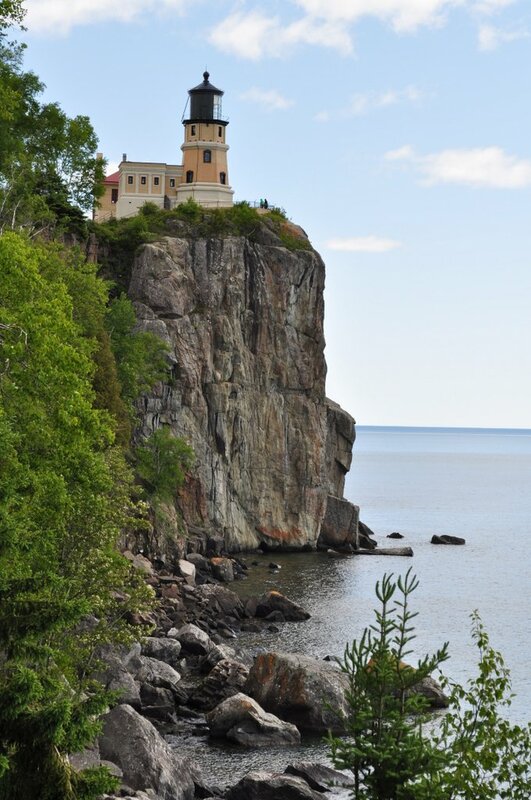 Just a little further north from Gooseberry Falls, and southwest of Silver Bay stands Split Rock Lighthouse, which opened in 1910. Its construction was prompted by a major storm a few years earlier after a ship came to grief on the rocky shore. In fact there’s a whole network of lighthouses around Lake Superior. Split Rock Lighthouse was decommissioned in 1969 once radar (and now GPS) was used for navigation. It remains an iconic site standing 100 feet above the lake, and attracts thousands and thousands of visitors each year – but thankfully not on the day we visited. 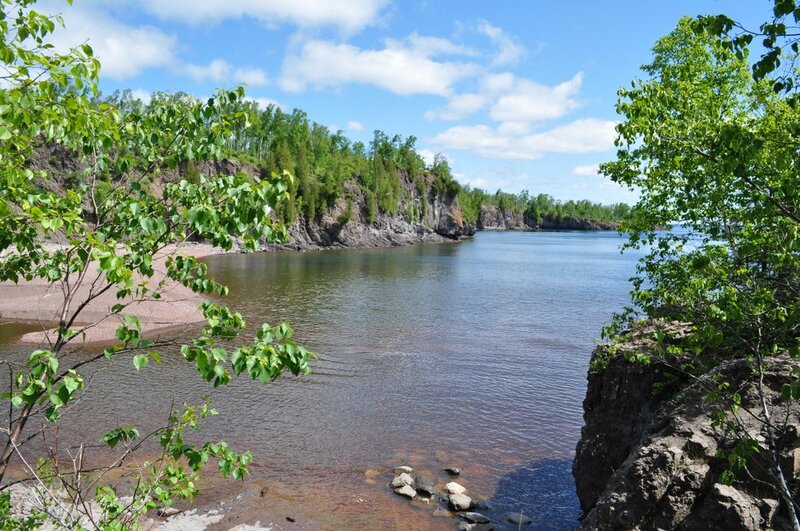 Next stop on our journey was the Temperance River Gorge and State Park, just south of Tofte. While the falls themselves were attractive, what we liked best was the small cove where the river meets the lake – very beautiful. Our travels ended in Grand Marais, a small town (and harbor, mainly for pleasure craft) about 50 miles south of the border with Canada, where we spent two nights. This was an excellent base to explore the Gunflint Trail and Superior National Forest in the BWCAW. The Gunflint Trail is paved, and extends some 57 miles inland. At the top end of the Trail lies Gunflint Lake, with the international border bisecting the lake. This was the closest, at about half a mile, that we came to Canada on this trip. 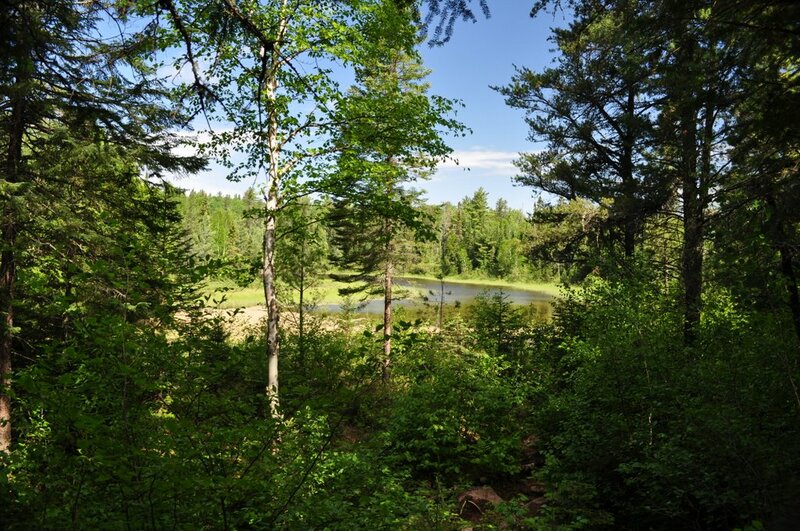 The BWCAW is a myriad of forest roads, and there are many resorts and eating places along its length, where camping and all manner of field activities and sports are permitted. Off the beaten track the only access is on foot or by canoe. Beware of bears! Unfortunately we didn’t see any large animals apart from a few deer. We hoped to see moose at a well-known site with an observation platform, and black bears as well (that had been featured on a major BBC TV broadcast from this area over several weeks in the month prior to our visit) – but none showed. We did see millions of trees. At the top of the trail it seems there had been a major fire in past years, and the vegetation is still recovering. One of the disappointments was the limited access to lakeside views along the trail. We did leave the paved road on the return journey, heading off down the Arrowhead Trail, and joining US 61 at Hovland, about 20 miles north of Grand Marais. We thoroughly enjoyed our trip to the Minnesota Riviera and, as with our trip to Arizona and New Mexico in 2011, we saw relatively few tourists. Indeed, along the Gunflint Trail it often seemed as though we had the whole BWCAW to ourselves. This is definitely a region of the USA that I would recommend anyone to visit. 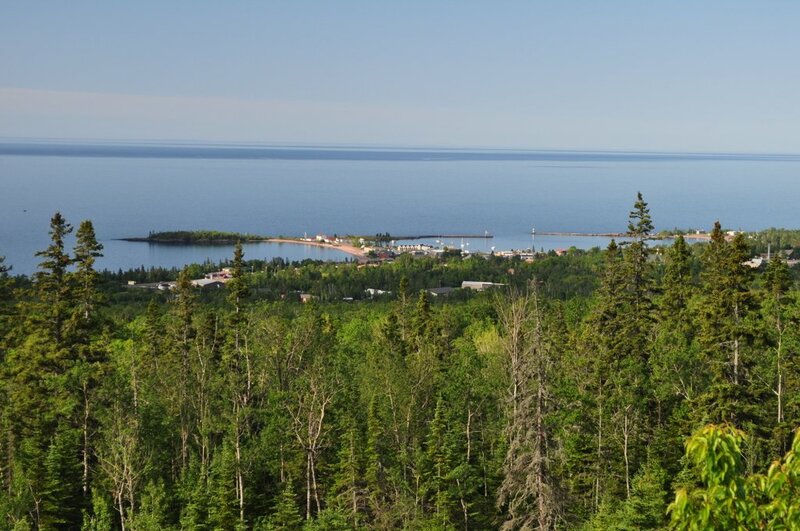 Until you have seen it for yourself, it’s hard to imagine the vast extent of Lake Superior. Of course, we saw the area at its best – blue skies, nice warm temperatures. There was a great diversity of wild flowers – especially the bluebonnets, a wild lupin species along the roadside (although not all were blue as we saw some white and pink specimens). On the trip south back to the Twin Cities, we decided to cross over into Wisconsin since we’d experienced some delays on I-35 due to road works and a contraflow. Around Two Harbors we ran into heavy downpours and thunderstorms which stayed with us all the way back to St Paul. A week later (in fact on the night of our homeward flight from MSP) there was a major storm that hit the Duluth area, dumping 5-7 inches of rain in just a few hours. Needless to say there was considerable disruption and damage to roads. We were very lucky to have avoided that. If you get the chance, do make a visit to the Minnesota Riviera – you won’t regret it. 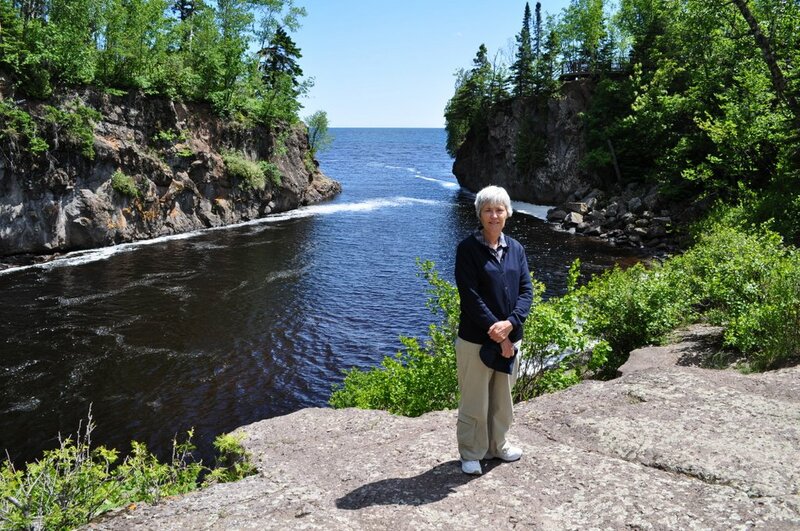 This entry was posted in Out and about, Travel and tagged Great Lakes, Lake Superior, Minnesota, North Shore. Indeed this area is beautiful and a magnificent place to vacation.